Background: To succeed in biomedical implant surgery, materials must be biocompatible. Willemite nanoparticles can be used in biomedical applications. MTT assay shows that willemite nanoparticles have non-toxic interaction between Hela (Cervical cancer) cell lines and the willemite found to be biocompatible for further applications in-vivo systems. In depth cell particle interaction was carried out, by using staining technique coupled with inverted microscopy. The antibacterial test was performed against Gram-negative Escherichia coli (E. coli, ATCC 8739) and Gram-positive Staphylococcus aureus (S. aureus, ATCC 6538). The optimal properties with excellent antibacterial ability can be achieved when willemite nanoparticles concentration is between 0.30 ppm and 2.3 ppm. According to the obtained results, the synthesized nano composite powder confirms biocompatibility of willemite, which could be an attractive candidate for biomedical applications. Methods: Pure willemite nanoparticles were synthesized via the modified sol-gel method. Synthesized powder was studied by thermo gravimetric analysis (TGA), X-ray diffraction (XRD), scanning electron microscopy (SEM), energy dispersive X-ray spectroscopy (EDS), and transmission electron microscopy (TEM) with SAED techniques. The in vitro biocompatibility of willemite was studied. The biocompatibility of the willemite nanoparticles was studied using Hela (Cervical cancer) cell lines with MTT assays up to 24 h.
Results: Willemite nanoparticles were synthesized by facile sol-gel method. The synthesis method is cost-effective and easy to scale up. The results of this work demonstrate the applicability of willemite nanoparticles in the biomedical field. The antibacterial rate increased from 65% to 99% while the cell viability decreased from 98% to 70 % when the willemite nanoparticles concentration varied from 0.05 to 190 ppm. Furthermore, the cytotoxicity studies show that the willemite has lower cytotoxicity. Hence, it is revealed that willemite nano crystals are potentially applicable as bone substitution materials in tissue engineering. Conclusion: Willemite nanoparticles possess effective in vitro noncytotoxicity and antibacterial activity. The favourable properties with excellent cytocompatibility and antibacterial ability can be achieved when willemite concentration is between 0.30 ppm and 2.3 ppm. The antibacterial willemite is non-toxic to the living cells and tissues even if the particles are internalized by cells. Willemite is an excellent candidate in the biomedical field. Novel willemite nano crystals may provide new opportunities for a non-cytotoxic implant with antibacterial ability in bone tissue engineering. Keywords: Luminescence bio ceramic, Willemite, Sol-Gel synthesis, Hela (Cervical cancer) cell lines, MTT, Antibacterial activity, Biomedical application. Keywords:Luminescence bio ceramic, Willemite, Sol-Gel synthesis, Hela (Cervical cancer) cell lines, MTT, Antibacterial activity, Biomedical application. Abstract:Background: To succeed in biomedical implant surgery, materials must be biocompatible. Willemite nanoparticles can be used in biomedical applications. MTT assay shows that willemite nanoparticles have non-toxic interaction between Hela (Cervical cancer) cell lines and the willemite found to be biocompatible for further applications in-vivo systems. 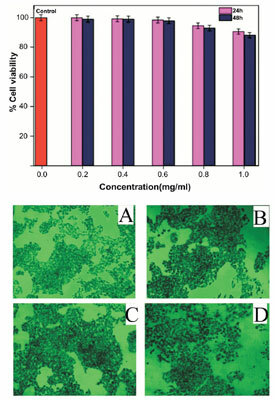 In depth cell particle interaction was carried out, by using staining technique coupled with inverted microscopy. The antibacterial test was performed against Gram-negative Escherichia coli (E. coli, ATCC 8739) and Gram-positive Staphylococcus aureus (S. aureus, ATCC 6538). The optimal properties with excellent antibacterial ability can be achieved when willemite nanoparticles concentration is between 0.30 ppm and 2.3 ppm. According to the obtained results, the synthesized nano composite powder confirms biocompatibility of willemite, which could be an attractive candidate for biomedical applications. HPV and Therapeutic Vaccines: Where are We in 2010?